The spirit of American entrepreneurship is alive and well. It is that spirit that is the drive and determination of these visionaries who are responsible for some of the most successful and ubiquitous products on the market today. Case histories abound with stories of vast technology companies who had their beginnings in garages; of two or three individuals collaborating on the next breakthrough in medicine; of small companies working with other small companies to bring the next innovation in video entertainment to the market place - even a worldwide social network begun in a university dorm room. While these stories are, for the most part, more accurate than allegorical, the products themselves did not come to market overnight. In fact, through trial and error, the process of attaining commercial viability can be a long process and can be a discouraging one – and it can prove to be expensive. It need not be. A solid manufacturing partner with a track record of working with small and start-up companies, as well as with individual entrepreneurs, can help make that journey from concept to marketplace a reality, with fewer stumbling blocks along the way. Small businesses are no exception and should be even more concerned about working with a good manufacturing partner. It is important to develop a relationship with a manufacturing company that believes in conceptual collaboration. Working together, designers, engineers and visionaries can utilize that manufacturer’s expertise and industry contacts. From the very first steps, they can collaborate to ensure that all phases of product design, development and manufacture -- even marketing in some cases -- work together. Sometimes called “concurrent engineering ”, it’s an uncomplicated concept that reaps large benefits. Teaming with a company that has those capabilities as well as years of technical know-how, a dedicated staff who will work with you to find the right answers to the challenges along the way, and with a global presence, can make the trip from idea to commercial product as efficient and cost-effective as possible. The strategy behind conceptual collaboration is simple. The principle of Occam’s Razor states that one should not make more assumptions than the minimum necessary to achieve the correct results. Well, in conceptual collaboration, one should not make any more product design adjustments during the manufacturing process than necessary. First, it is critical to find a manufacturing outlet that is not only willing to work with you or your designing/engineering team, but also has the experience, expertise and industry connections to guide you at each step of the way. At each stage of your product’s development, it is important that a team of experienced technicians be available to make sure that each phase of the process is on track and in sync with all the other phases. Multidisciplinary teams should work in parallel from the start of the project to test and make sure every detail in every phase is correct before moving on to the next. This saves unnecessary revisions and duplications in the process, cutting down on not only the time to market, but the expense of multiple design revisions. Initial input needs to be obtained from as many sources as will be involved in the project for the duration. Joining forces early in the workflow means that any necessary compromises can be made in areas such as design and incorporation of all features, availability of product, assembly requirements, material needs, and cost and time considerations. If potential pitfalls are recognized early, design and manufacturing reconciliations can be made with little workflow interruption. It is generally accepted that conceptual collaboration, or sequential development, can result in anywhere from 30 – 40 percent savings in overall project time and cost. Early collaboration with a company is only part of the equation. Just as important is who that company is. A company with a successful track record in collaboration through to finished product is of prime importance. As an example, FLEXcon has worked successfully with a number of innovative engineers, designers and scientists in developing commercially viable products for a variety of industries. Most recently, an innovative surface application film was developed that decreases the need for bactericide in health care settings. This film, called Sharklet®, inhibits the growth of bacteria by not allowing it to grow on a specially designed surface similar to a shark’s skin. In collaboration with University of Florida’s Dr. Anthony Brennan, FLEXcon was chosen for this project because it is the only manufacturing company with the know-how and capability to transfer, microscopically, that pattern of shark skin design to a wide-web construction, allowing it to be commercially viable. The material is currently in use and being studied at the University of Colorado Hospital. The progress in this field of microstructure research has shown that, with the appropriate collaboration and the experienced technical specialists, commercially viable products can be developed and brought to the marketplace in a timely manner. Constant communication and input is not only functional but feasible. Other researchers and designer have contacted FLEXcon and our experts are working closely with them on products and designs such as the mapping of the topography of a moth’s eye in an effort to determine its effectiveness in an application for photovoltaic use. A moth’s eye has an unusual property: the surfaces are covered with a natural nano-structured film which eliminates reflections. While also acting in that protective capacity as a natural defense, this lack of reflectivity also allows for greater light absorption. If successful, the application of this technology will increase the light-gathering capabilities of standard photovoltaic cells by some 15 to 20 percent, thus increasing their efficiency in gathering available light, and also amplifying their storage capacity. This will potentially create a much more efficient solar cell, enhance the potential use of this alternative energy source and, hopefully, decrease our dependence of fossil fuels. Other capabilities include film casting, the production of very thin layers of polymeric films that can be used in a variety of unique applications in the aerospace and medical industries. Making use of the readily available expertise of polymer developers, FLEXcon is able to use its manufacturing assets and wide web roll to roll processing capabilities to create these unique film functions. One of the stumbling blocks to exciting and innovative products has, in the past, been either the inability of companies to conceptually collaborate with those in the research fields, or the fact that many companies just don’t have the capabilities to carry projects through from start to finish. FLEXcon, which has decades of experience, is a company that can offer a wide choice of options to meet whatever needs you may have during the production process. conceptual collaboration works in all instances. During all phases of manufacture, it is imperative to involve cross-functional teams, from technical to quality assurance, purchasing, marketing and a large list of suppliers and service representatives. Work with companies that provide a vast range of technical knowledge. At FLEXcon you can tap into our process engineers who understand our process capabilities to develop the product you need to create. In today’s market, it is not necessarily those who build a better mousetrap, but those who can get it to market quickly who will reap the rewards. Concurrent engineering, conceptual collaboration, integrated product development – call it what you will, its benefits to designers, manufacturers and the marketplace in general, can be substantial. In addition to the project cost and time savings, working together with a company who has the technical know-how, a variety of ancillary products, solid relationships with suppliers and a global presence can assure future products will be of the same quality and consistency as any prototype developed together. Knowing that collaboration with a company you can trust and can rely on to provide the same type of service for any of your future projects is a relationship well worth cultivating. William Sullivan is Vice President, Performance Products for Spencer, MA-based FLEXcon, Inc., and oversees a department responsible for, among other things, the development, marketing and commercialization of high performance adhesives, functional coatings, film castings and the creation of functional microstructures. Author of published articles primarily on FLEXcon’s success in helping in the creation of Sharklet, a functional microstructure which prevents the growth of bacteria through its microscopic design capabilities, his expertise is in assisting start-up companies and enterprises with bringing their concepts and ideas to commercial reality. FLEXcon is an innovator in adhesive coating, laminating and finishing of durable materials used in graphics applications, electronics and new products. Through a culture of curiosity, flexibility and a drive for excellence, FLEXcon is the trusted partner to a wide range of companies from printers and fabricators to engineers and designers developing products for existing and emerging markets. Headquartered in Spencer, MA the company has operations throughout North America and Europe with distribution worldwide. For more information, visit www.FLEXcon.com or call 1-508-885-8200. 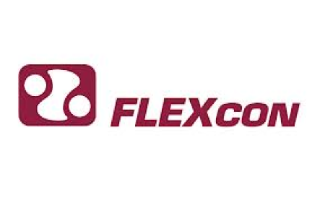 Follow us on Twitter @FLEXcon.